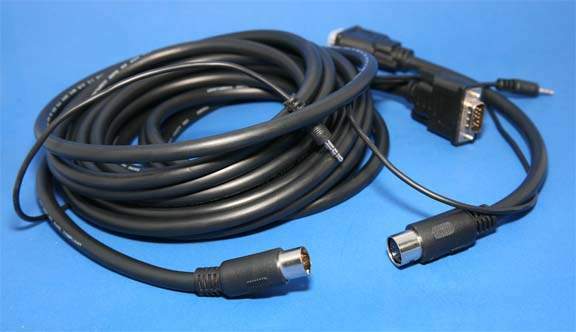 Connects any VGA video with audio to any computer, switch or splitter with HD15/3.5mm stereo female ports. This cable feature a "Quick Snap" connection approx 12 inches from one of the end allowing you to easily connect, and disconnect the cable for easy installation in a tight place or conduit. This premium commercial grade combo cable eliminates clutter and improves cable management. * Supports all SVGA monitors including analog flat panel display, high resolution desktop, CAD and graphic workstations. * Quick Connect maximum diameter: 3/4"
* Triple shielding for maximum graphics performance, prevents signal loss, screen ghosting & loss of color and works up to 200ft without a signal booster. * Inner hood soldered 360 degrees to the connector for complete end to end shielding. * Note: The stereo audio cable is 15inch on both ends.